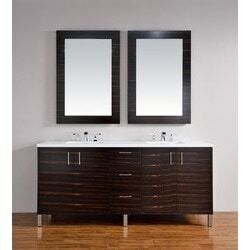 Vanity cabinet may be hung on wall, or chrome finish metal legs may be used for the cabinet to sit on the floor. Birch Solids with American Walnut Veneers over hardwood plywood cores for strength and reduced flex. Height without legs is 27.6"